Since Dad’s birthday was last weekend, all of us girls went down and spent a fun afternoon at the movies and at Pizza Hut to help celebrate. While I was there, I was able to sneak in eating a plate of my mother’s lasagna. I’ve tried many lasagna’s, but I will always love my mom’s recipe the best. When I came back home, I was still craving pasta so I decided I would try using up the tofu in my fridge by making ravioli completely from scratch. 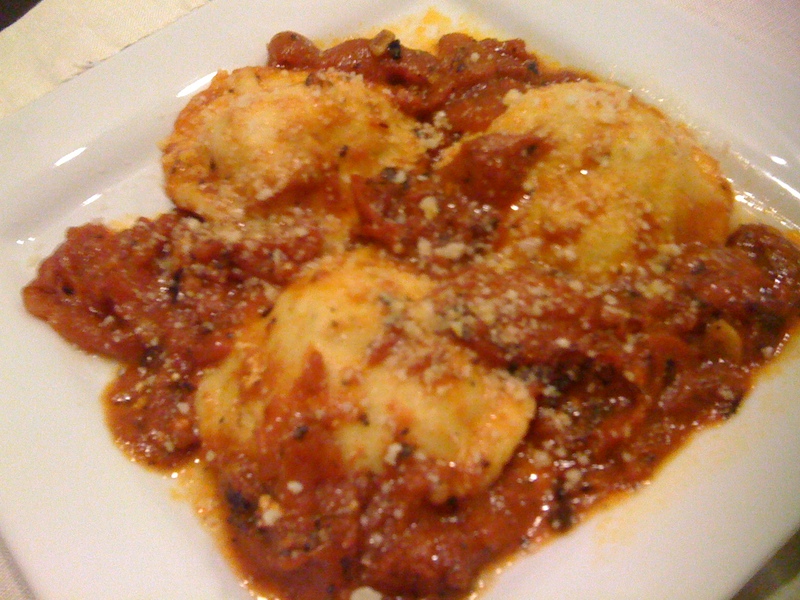 The tomato sauce and the ravioli recipes I based my recipes are both by Fabio Viviani from Chow Ciao! Add 4 eggs, the olive oil, salt and pepper to a food processor with the blade attachment in it and pulse a few time to combine. Add 1/2 cup flour to the processor and pulse until well mixed, test for the stickiness of the pasta. Gradually keep adding flour (about 1/4 cup more) to the processor and pulse until well mixed and the pasta is no longer sticky. You should start to see a small dough ball form in the processor. Remove dough and form into a ball. If you have a pasta machine, roll out the dough to flat sheets, dusting with flour to help flatten. If you do not have a pasta machine, tear off about 3 tbsp of dough and flatten into a rectangle using a rolling-pin until the past is thin enough. Mix together the tofu and ricotta. Dollop 1 tbsp of the mixture per ravioli on the sheet of pasta. Brush the edges of the pasta sheet with water, fold the sheet over the ricotta and press down seal. Cut a circle around each dollop using the rim of a glass or jar. Shape the ravioli as desired and set aside. Make sure to keep the pasta covered by a moist towel so it does not dry out! While waiting on a pot of water to boil, start on to the tomato sauce below. 28 oz jar of fire-roasted whole plum tomatoes (packed in only tomato juice). You can usually find this at your local Whole Foods. I recommend never using canned tomatoes because of the higher BPA levels. Seasoning mixture – I use a mixture of basil, thyme, rosemary, oregano, and marjoram. Smash 6 cloves of garlic with the back of a knife. Add tomatoes, seasoning, and a generous pinch of salt and pepper. Cook until thick ( about 8 to 10 minutes) and no longer watery in consistency. Start cooking the ravioli in the boiling water. They should only cook for about 2 minutes each. Add 4 more tbsp of olive oil and turn up the heat to high. Crush the tomatoes with the back of a wooden spoon. Start adding the cooked pasta to the tomato sauce so that it can soak up the flavor. Cook until the oil turns red; this will tell you the sauce is done. Serve the pasta garnished with parmesan. Because of the tofu, I can only have about 2 or 3 ravioli before I am full so prepare for lots of leftovers! The sauce is very yummy and I use it for various other dishes so you might want to make a big batch and can the rest. Enjoy! Since week 1 of my New Year’s Resolution was a success, I was really looking forward to the recipe I had chosen for this week’s post. I’ve always wanted to use tofu in a recipe, but I never came across a recipe that sounded good to me. I was once again browsing through recipes on Pinterest and I came across one that seemed easy to make and delicious. 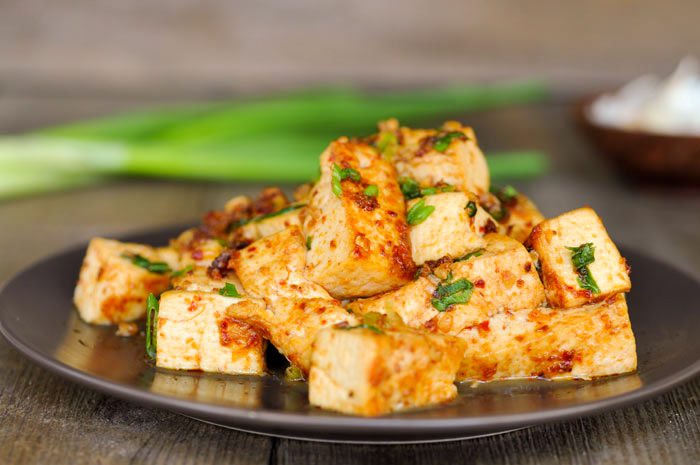 This recipe for Tofu with Roasted Chili Paste came from the Rachel Cooks Thai blog. I decided to change it up a bit, because I couldn’t find the exact paste that she used. The closest I could find at my store was red curry paste. Also, I didn’t have any rice at home so I decided to use noodles. I really like to add vegetables to my dishes, and green peppers just seemed right with this dish. Keep in mind that you will probably have to open some windows or doors when you cook this, since the smell was quite strong in my apartment and lasted a couple of days. I will say that this recipe kept me on my toes. Some of the red curry paste got on the burner and produced minor flames (I’m okay! ), and I accidentally burned the garlic the first time so I had to start over. Again, I would like to reiterate that I have never been a good cook and this weekly exercise is to try new foods and to become more comfortable in the kitchen. This is how it's supposed to look! Cut the tofu into medium-sized rectangles and blot dry on paper towels. Saute the garlic in canola oil over medium high heat. When it’s almost golden brown, add the roasted chili paste and sauté for a few seconds longer. Then add the tofu and coat well with the chili and garlic. Cook until the tofu is golden brown and the chili and garlic have formed a slight crust on the outside. Add green onions, cook for a second longer, and then take off the heat. Serve with jasmine rice. This is how my attempt turned out. Prepare Asian noodles as directed on package. Meanwhile, cut the tofu into medium-sized rectangles and blot dry on paper towels. Saute the garlic in canola oil over medium high heat. When it’s almost golden brown, add the red curry paste and saute for a few seconds longer. Then add the tofu and coat well with curry and garlic. Add green peppers. 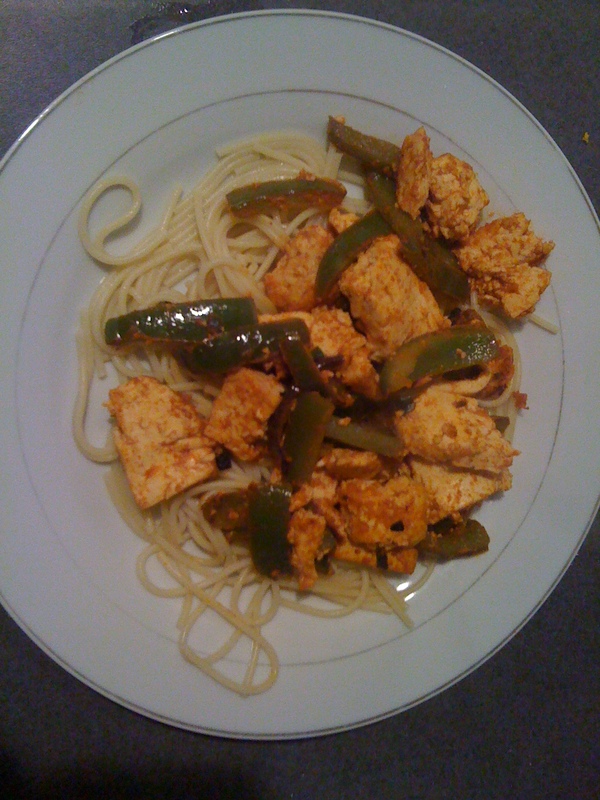 Cook until the tofu is golden brown and green peppers are slightly tender. Add green onions, cook for about 30 seconds, and take off heat. Serve over asian noodles. Although there were some minor mishaps, I was pretty happy with how this turned out. If you’re in the mood to try something new, different, and a little spicy, I would definitely recommend this recipe. Do you guys have any favorite recipes using tofu? This is an inspirational blog that allows four sisters to express ourselves through God, crafts, and daily life happenings. Each one of us is unique in our own ways and though we are all in different walks of life right now, the bond that we have as sisters will always be there.